Look at the size of this sucker!! I am so stinking excited for summer! We joined a CSA for the first time, and I can’t wait to end up with too many vegetables. It is my goal to not let any of them go to waste, so I might be asking for recipes soon. This is an easy one, so you should totally make it. Just the right amount of creamy goodness and chewy texture. 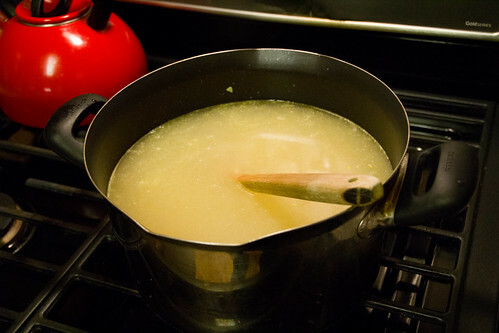 In a large stock pot, heat a splash of olive oil over medium heat. Add the onions and saute for about 5 minutes. 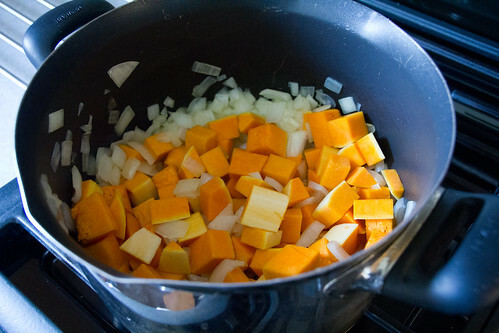 Add the squash cubes and vegetable broth. 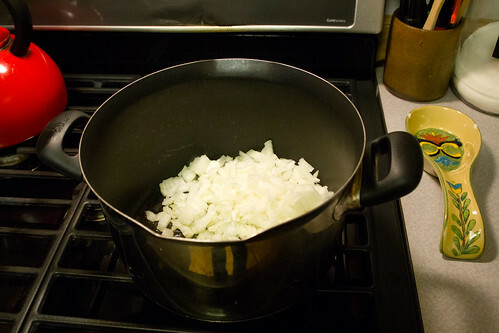 Turn the heat up to high, cover the pot with a lid, and allow the soup to come to a boil. Reduce the heat to low and cook for 30 minutes, still covered and stir occasionally. 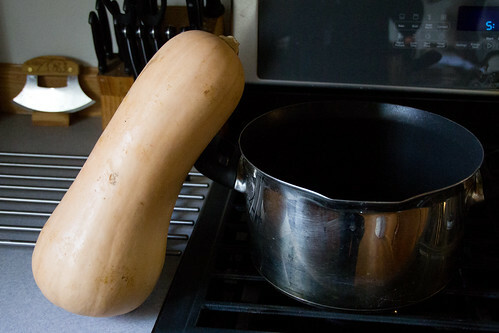 Turn off the heat, and use an immersion blender to puree the onions and squash. 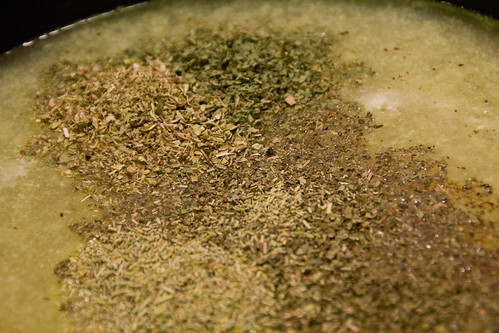 Or transfer the vegetables to a food processor and puree until smooth, then add the paste back into the vegetable broth. Next add the Garbanzo beans, seasonings, and half and half or coconut milk. 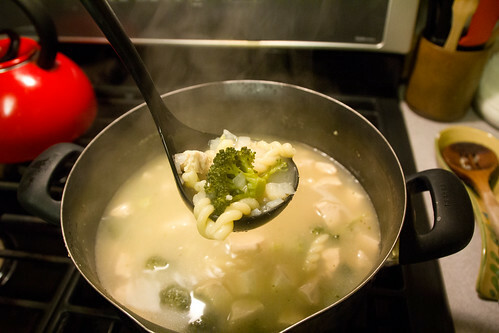 Allow the soup to cook over low heat until it’s warm enough to serve. 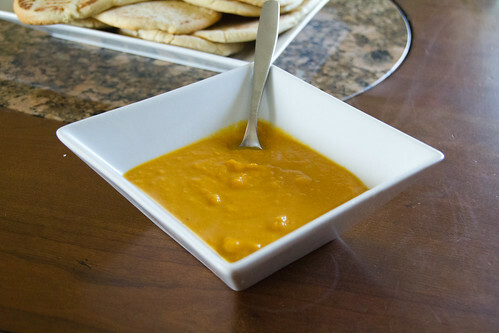 You should also serve this with Naan. It’s so right. 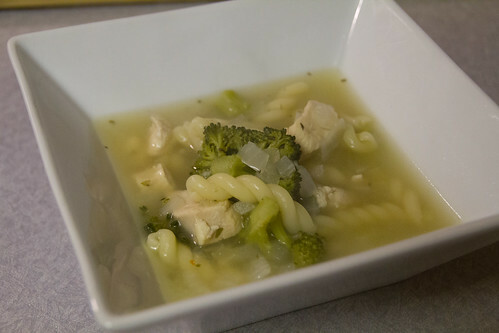 This soup makes really good leftovers, either hot or cold! 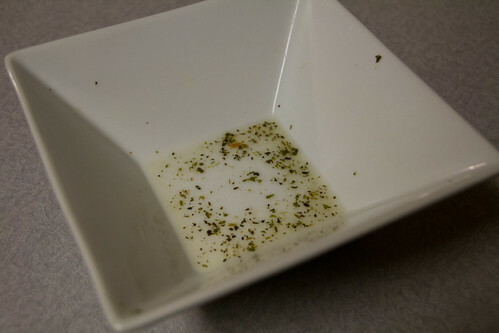 I love this soup. A lot. There’s not a lot of room for improvement, if you ask me. But what if…What if I could just shake things up a bit? And then a head of cauliflower appeared, nestled amongst the squash. Perfect! 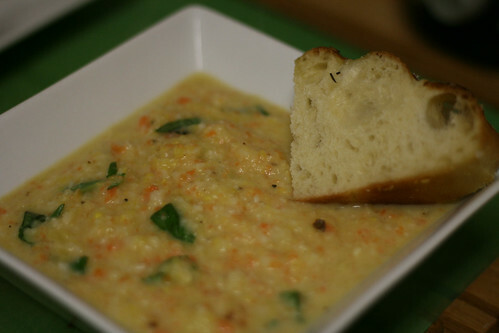 A vegetable to add texture and creaminess without drastically changing the flavor of the soup. Brilliant. Because I’ve never tried it before, I decided to roast the cauliflower. It’s easy. Preheat the oven to 400F. 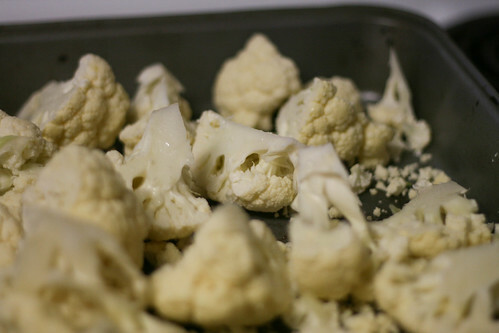 Chop the cauliflower, spray or drizzle with olive oil, salt, and toss into a pan. Roast for about 20 minutes, stirring things around at least once. They’ll come out slightly brown and super fragrant. Yum. 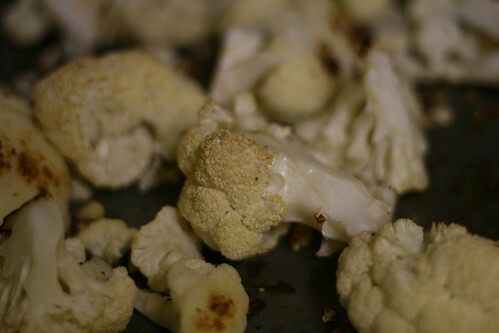 And you can start the soup while the cauliflower is roasting. Serves a ton. 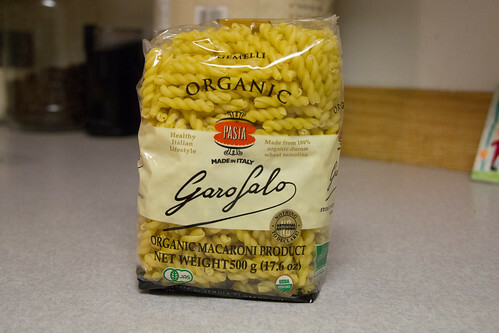 Feel free to cut the recipe in half or third if you don’t have the storage space. 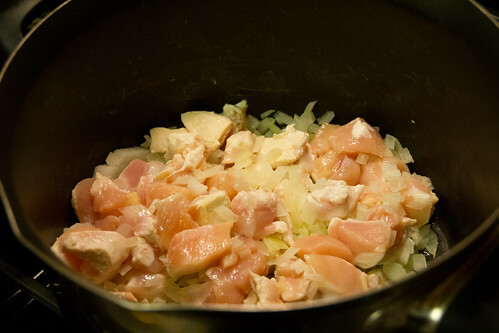 Heat oil in a large dutch oven or soup pot. Add onion and cook about 5 minutes. Add squash and carrots, mixing until the onion is incorporated. 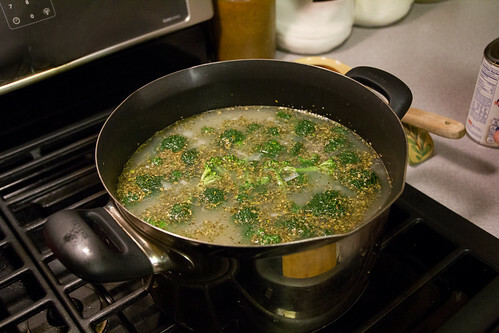 Add warm water and BTB, bring to a boil, then cover and simmer for about 20 minutes. You can either use an immersion blender, or you can transfer small batches of the squash mixture and cauliflower into a food processor and puree to desired texture (we like ours a bit chunky). 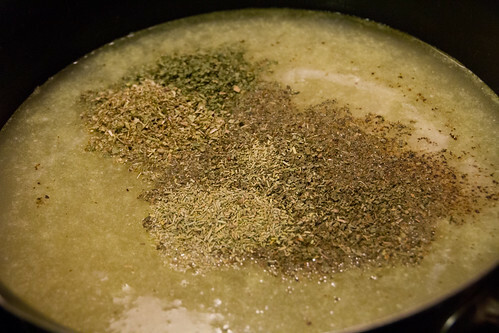 Once everything is mashed up, season with salt and pepper, add the half and half and heat through. Just before serving, stir in the shredded basil leaves and season again with salt and pepper if necessary. 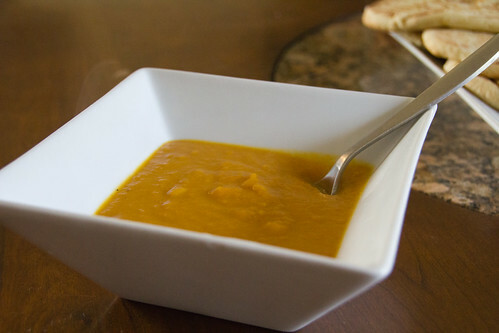 This soup is equally good hot or cold. I like to eat it hot for dinner, and then chilled the next day at lunch.